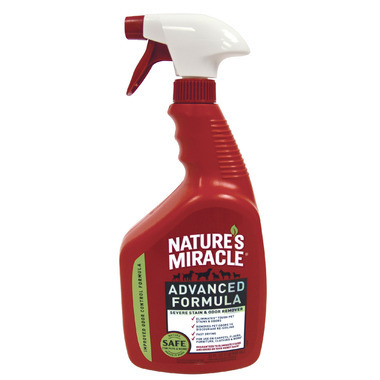 Nature's Miracle Advanced Stain & Odour Formula Spray is guaranteed to permanently eliminate all stains & odors - even urine odors other products fail to remove. Removes all organic stains and odors, including foods, blood, vomit, feces, grease, dirt, grass, smoke, and perspiration. Will also work on old and deep-set stains and odors. For use on carpets, floors, furniture, clothing, cages, litter boxes, and all pet living and sleeping areas. Before using, test surfaces to be treated for color fastness by applying to a hidden area; wipe with a cloth. If color is removed from the test area, do not use on those surfaces. Always use at full strength. Always use Nature's Miracle Advanced Stain & Odor Remover first! Other cleaners and detergents may fail and chemically "set" stains that could become impossible to remove. Not recommended for use on silks, leather, or suede. Excellent product. I use it all the time and not just for pet related issues. This is my go to product! A must have! I would have it even if I didn't have pets! Absolutely fantastic product!!! Works so well on virtually any stain and surface. We would never be without this wonderful product.